Guildmaster Sees-All-Colors is the new Guildmaster for the Fighters Guild following the death of her mentor, Jofnir Iceblade. She has been directing almost all of the Guild's efforts to destroying Dark Anchors. Anchors from the Harbour: Find two Guild members who were investigating Dark Anchors. The Dangerous Past: Search a Dwemer ruin for signs of an ancient weapon. The Prismatic Core: Help the Guildmaster understand the threat to the present in the events of the past. Will of the Council: Enter Coldharbour and destroy the Mortuum Vivicus. Join the guild, then talk to Sees-All-Colors to receive further instructions. "Comrade! We have need of you. Will you fight by our side?" "The guild has accepted an unusual contract. We've agreed to eradicate Daedric Anchors when they drop from the sky. Wherever they appear, Molag Bal's minions soon follow." "As we speak, two of my guardians investigate rumored anchor sites. Merric and Aelif are the best the guild has to offer. Meet up with them on the beach east of Vulkhel Guard. You can proceed from there." "I know you'll change the river's course, comrade. They're investigating the coastline, down the beach from the Guard Lighthouse." "As we speak, two of my guardians investigate rumored anchor sites. Merric and Aelif are the best the guild has to offer. Meet up with them outside of Daggerfall. You can proceed from there." "I know you'll change the river's course, comrade. They're investigating the wilds nearby, at Riverden Falls." "A powerful benefactor. She hates that monsters can ruin the lives of everyday folk. Our benefactor has put gold behind her principles. And so, we put our strength behind her cause." How is the contract unusual? "The size of the task. Our benefactor has asked we call in every guildmate, from the lowest associate on up. Every member of the Fighters Guild has been tasked with ending this Daedric corruption." Can you tell me more about Daedric Anchors? "They are tendrils of Coldharbour, reaching into Nirn. The minions of Molag Bal erect dark shrines in his honor, landing sites for these horrors. The coin this contract brings is good. And in this time of trouble, we need a focus." "Yes, I am new to my role as guild master. The death of my mentor, Jofnir Iceblade, has been hard on the Guild. He was well-liked among the rank and file. I hope the river has carried his soul where it wanted to go." "He's a proud Redguard warrior, one of our best, and a follower of Stendarr. Merric's full title is "Resolute War Horn". He's sworn to fight the spawn of Oblivion wherever they touch Tamriel." And Aelif? Who is she? "Proof that the guild accepts all kinds. A Khajiit. She does as much damage with her wicked tongue as with her curved blade. Taciturn, rude sometimes. But a cunning fighter." Meet your guildmates, then report back to Sees-All-Colors about the projection of the Dremora you've seen. After you have returned from helping Merric and Aelif. Merric and Aelif stopped the cultists, but a projection appeared to us. A Dremora woman. "A vision of a Dremora … this clouds the waters. The forces of Molag Bal must know more than we realized. What did she say?" She talked about a Mortuum … Vivcus? I don't know what that is. "Nor do I, comrade. Interesting. Did she say anything else?" She said she'd take a Redguard's soul. She's going after Merric. "Merric? This dries my scales. Recruit, you must get to them. Aelif and Merric are competent, but the Daedra are not to be trusted. Find them near Skywatch. I will rally our forces here, and investigate this Vivicus. Whatever it is." Talking to her right after this, she'll say, "Good luck in the field, comrade. I know you'll do your Guildmates proud." Save Merric and meet the Guildmaster outside Buraniim for a reward. "You're the sun on my scales, comrade. You've returned Merric to us." He was captured by a necromancer, a follower of Molag Bal. "Molag Bal! May he burn in the glare of a thousand suns! It's just like him to send an assassin to kill a noble warrior. That's a coward's weapon." She wanted him for something called the Mortuum Vivicus? We found this journal and some notes. "Xuth! The Mortuum... what? And I can't make tails or scales of these scribblings. No matter. It's going to take time to decipher this scrawl, but we'll put our best scribe on it." "You've done a great service for the guild today, comrade. I look forward to drawing steel with you in the future. If we learn anything from the journal, I'll make sure you hear about it." "I'll look for you down the river, comrade. You'll hear from us once we've decoded the journal." May I ask you a few questions, Guildmaster? "Of course. After-action report, yes? Wise choice." I saw a ghost here, on the island. He claimed to be the last Guildmaster. "Jofnir? His passage down the river called me to this post. What did he say?" He told me where Merric was. He seemed rushed. "Interesting. I'll get in touch with some of our sisters in the Mages Guild, see if they can investigate this apparition. I try to avoid the walking dead, when I can." How long do you think it will take to decipher the journal? "Not long. Aelif told me you found some trinkets with the cultists. Between those baubles and the notes you found, hopefully we'll have a start for the translation effort." 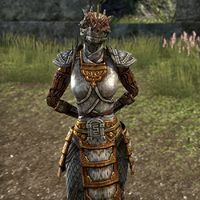 Sees-All-Colors also appears in one of the Hero's Guides books as the Argonian champion, modeling her race's armor. Sees-All-Colors also appears in the Alliance War card expansion for Legends as the card Guildsworn Apprentice. This page was last modified on 17 April 2019, at 01:17.